İlhan Koman entered the İstanbul Academy of Fine Arts in 1940; after studying painting for a year he transferred to the sculpture department and studied with Prof. Rudoph Belling. After his graduation he received a state scholarship and went to Paris in 1947 where he worked in l’Académie Julian and l’École du Louvre, and opened his first solo exhibition (1947-51). He produced his first iron works in İstanbul between 1951 and 1958 at the Academy’s sculpture department and workshop of which he was the co-founding instructor. In the same years he started the furniture company “Kare Metal” together with Şadi Çalık, Sadi Öziş, and Mazhar Süleymangil. In 1955 he joined André Bloc’s “Groupe Espace 1951” and declared the Turkish “Groupe Espace” together with Hadi Bara and Tarık Carım. In these years, he made the embossments in the east side of Anıtkabir, together with Zühtü Müritoğlu. In 1957 he was invited to the Brussels World Fair to represent Turkey. In 1958 he moved to Stockholm where he took a professorship at the Swedish School of Arts Crafts and Design, Konstfackskolan, and lived here until his death in 1986. In 1965 he bought the two-mast Baltic schooner and cargo ship M/S Hulda and made this 1905-made sailing ship into his home. M/S Hulda was to be his home and workshop until his death. His latest work mostly consists of project design to be actualized in largescale. Some of these projects are registered with the Swedish patent Office. Koman had his first solo show in Paris in 1948, followed by numerous local and international group exhibitions around the world. He participated in the Venice Biennial in 1956, 1962 and 1976, the São Paolo Biennial in 1957, 5th Tehran Biennial in 1966, 2. International Contemporary Sculpture Exhibition at Musée Rodin in Paris in 1961 among many others. Koman also worked on various public art projects in Turkey and Sweden. He was also a writer and a researcher; and some of his innovations were patented during his lifetime. 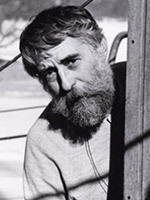 Koman passed away in Stockholm in 1986. In Turkish sculpture, he is well placed among those effective members who search for new dimensions and who abolish the traditional form of the former generation. Koman, who examined closely various art movements since his years of studentship, also examined closely the contemporary art movement when he was in France and he adopted the geometric-abstract perception. He made expressionist-abstract works in the years of 1963-64. After 1965, a lyric-abstract expression was started to be seen in his works. He made experimental works on geometric shapes in the beginnings of the 1970s. 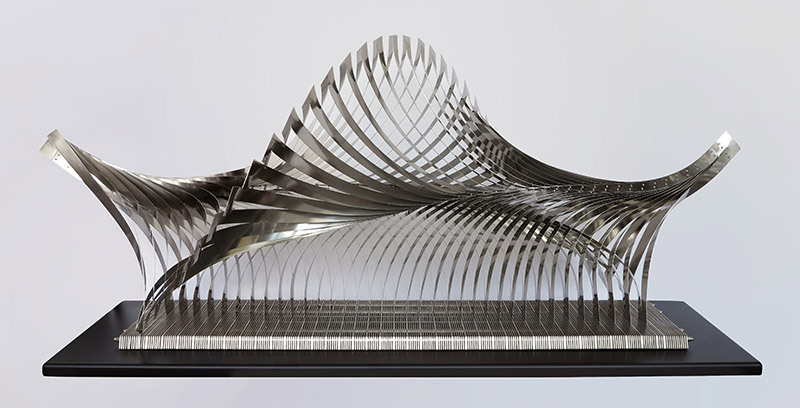 In addition to completely geometric-abstract sculptures, he also realized a series of sculptures name Sonsuz that were the synthesis of figurative and geometric shapes. He created a dynamic installation with a spiral arrangement in these works. In 1980, he screwed the metal bars to each other and he created a series of monumental sculpture that recalled the antique Nike sculptures. The Project of Koman winning the first place in the competition of square arrangement in Sundsvall in 1967 was implemented in 1971. In 1970, his work named Leonardo Anıtı was deemed worthy of one of the first price awards (together with the architect Çetin Kanra) in the competition of the sculpture to be put in front of the Municipality Building of Örebro. This work was bought by the Swedish government afterwards and was put in front of the Stockholm Architecture High School. In 1981, he won the Sedat Simavi Vakfı Görsel Sanatlar Ödülü (T.N. Visual Arts Award from the Sedat Simavi Foundation), together with the painter Yüksel Arslan. He participated in the expedition of the Grönningen Group in Denmark as a guest artist in 1986. In Turkey he is best known for his relief at Atatürk’s Mausoleum, and various bronze and iron works. His works that span a wide range of innovative materials and methodologies are presently found in the collections of Moderna Museet, Stockholm; Musée d'Art Moderne de la Ville de Paris; Museo J. Battle, Montevideo; Museum of Modern Art (MoMA), New York; National Museum for Painting and Sculpture, İstanbul; Palais des Beaux-Arts (BOZAR), Brussels; Seattle Art Museum, Seattle; santralistanbul and Boğaziçi University, Istanbul. İlhan Koman is one of today’s rare world artists that bear universal value (in terms of both space and time). He seems to be an artist from the perfect world which Plato, the student of Socrates, has depicted as the "world of ideas": In the course of his production, from his student years to his death, he studied the people, the nature, the architectural consciousness, the mathematical /geometrical/physical phenomena, as well as the scientific principles and the current technologies. The works that he produced from these studies have made him an epitome of that which defines the "genuine artist". His work communicates to us his choice of diversified materials, the radical practices that he has exploited by manipulating (in Abidin Dino's words, "by tormenting") the material, and a dissociated, diversified, singularized wealth of forms and narratives. Koman is the representative of an artistic understanding in which his curiosity in the world and his formal language grow younger as his age grows older, which captures the viewer with a playful impression, which invites the viewer to an understanding through bewilderment, intensity and thought. If we look carefully we will identify, in his scrupulously calculated compositions, an awareness about space, a distribution of masses, a plastic equilibrium, a fabric, and a system of the variable and the dynamic. His designs, which bear the quality of a lecture on the basics of the art of sculpture, are, as well, wrought by an experimental vision in spite of their scientific construct. Material is part of the work’s contextual integrity in Koman. He has always challenged the limits of the material to reveal its unique properties and sought to translate these limits into his work. These works are the prototypes of the endless possibilities and of the dynamics expressed in their distinctive language. The products of his 10-year iron period from 1956 to 1965 dissociate space with a persistent energy. His clay works seem to find it easier to whirl, to bend and to twirl than to stand still. In the 70s İlhan Koman began to regards art as a systematic form of research that leaves room for intuition and creativity. While researching on how nature has sculpted space, on the secrets of planes and forms, he began collaborating with other scholars, with mathematicians who seek to unravel the same kind of mysteries. The artist has, without doubt, built a connection between the poetic scheme of the universe and the mystery of mathematics. The works which he created after the 70s are the designs of a level where poetry, reason and mathematics coalesce as geometrical abstractions. İlhan Koman’s definitions of idea and reality mature in a universe where art, science, creativity and innovation intertwine. The works he produced between 1975 and 1985 using wood, metal and synthetic materials stand tall in defiance of gravity. He sculpted the wind to build his Rotors, he used the power of nature as material. His poetic forms use gravity, flexibility, equilibrium and motion to challenge the known limits of nature. These all-new and spectacular forms each have a reality and a place in the world of science. Each seem to be the answer to a question in engineering, in architecture or in physics. Seeing İlhan Koman’s innovative hyperforms, a renowned theoretical physicist had said that these forms would shed light on the structure of the crystals –an enigma unsolved at the time. The flexible hyperforms that he produced are reduced to two-dimensional objects when folded. This property makes them each an invention that can be exploited in air and space vehicles, or in the space structures of the future. His so-called Komansrotor designs whose planes, hence speed, adjust to the force of the wind have contributed to the search for alternative energies that had intensified in the 70s. In some cases the viewer becomes as much a part of the work and its movement as the material itself, and it is the direct participation of the viewer that triggers the movement of the work, as is in the Dervish (1975), and the Rolling Lady (1983). The movement extends in the imagination of the viewer and the form continues into infinity in the Infinity Minus One derivatives, in the Endless Column, or in the Hyperforms. The Infinity Minus One series which he began in the late 70s best reflect these topics that he dealt with. The Infinity Minus One series is a group of derivatives which bases on the elemental unit shown here in his own drawing, and which creates new forms through reiteration. Setting out, perhaps, from a simple “youthful” thought that can be attributed to an association with the tails of the kites that he had made in Edirne in his childhood years, this is a form that can be said to stylize the key to the possibility of shaping the notion of infinity. Created by presenting a different derivative of the same concept in every work, we see a threedimensional series. In this process Koman produced models using aluminum, wood, and stainless steel, and in fact, when he attempted to use steel in the production of a monumental-scale version for the Huddinge Hospital in Sweden, finding that steel was inadequate for such large-scale implementation, he exclaimed: “If we could only produce this in titanium.” His desire was to exploit the nature of the material to achieve the flexibility he needed to make room for all his ideas. Today, the series is being re-produced in titanium, using different colors and shades on the surfaces, accentuating the structure of the design and showing the number of turns and waves. Koman intuitively apprehends the universal order behind forms and makes discoveries in harmony with this order. The Hyperforms, the Moebius Band, the Infinity Minus One derivatives –every design that he created from 1975 until 1986 are the different presentations of a single ‘structural principle’ that has been abstracted from nature. This principle is the ‘Golden Ratio’ that finds its roots dating back thousands of years, in other words, it is the quantitative order underlying formal aesthetics. The fractal root of this order, the ‘Golden Spiral’ is everywhere. It is by which the universe extends. Koman’s works are the subjective interpretations of this very fractal form. In a manner they are not artifacts but mysterious beings fortuitously discovered. Like ‘idea’s that bear the coding of the universe, that constitute the foundation of civilization. He prepared the Coat of Arms for the Swedish Parliament and put a small note on its backside: “A twist of life. Your countries insignia was made by a dark-head” He saw the ugly face of racism, he fought to protect his personal life from historical tradition, political and cultural authorities, and existed a universal artist. For Koman, the city would be worth living in when people become the measure. The abstraction in this aims at man and space, strips off their temporary identities within history, and places them into infinity. Its purpose is to give people a creative, subjective viewpoint, to remind them that the conditions they live in are not one and absolute. The artist must work to create a fresh plane of reality that will give back man’s freedom and power. The Turkish Groupe Espace which İlhan Koman and his friends founded in 1955 acted in this vision as part of the international organization. The “Infinity Minus One” series are a set of derivative artworks following the element as a base for iterative (repetitive) shapes. Koman is inspired from the kite-tails he made in his childhood in Edirne. By taking a single paper sheet and cutting it like the illustration below, we obtain a kind of garland multiplying the length of the original rectangle and permitting to create an amazing shape. In derivative works of “Infinity Minus One”; such as “Infinite Pillar” or “Hyperforms”, motion becomes perpetual in the audience’s minds, while the form reaches towards infinity. Koman uses the wind and the force of nature as the material while creating his rotors.